Vanilla is commonly assumed to be a type flavouring typically integrated into a wide assortment of desserts. Despite the extensive popularity of vanilla, not many individuals are aware that it is actually a type of orchid – one of a rare number of orchids largely cultivated for mass-consumption. For those who are into cooking, the origin of the vanilla may not be that obscure. It is general knowledge that all true, pure, and subsequently highly flavourful vanilla is derived not from extracts or from synthetic imitations, but from the whole vanilla bean itself (despite the fact that it isn't even a true ‘bean'). Vanilla was initially an extremely valuable and rare commodity, and in its early transition from being an exotic commodity to an integral part of Western cuisine, it once held the status of being a spice, and then an herb – and then reverting yet again to the status of a spice, a status it keeps to this day. The vanilla bean is said to be among the most expensive of spices in the past, with its reputation as such enduring to this day. This is due to the fact that the cultivation, preparation, and propagation of vanilla is an extremely long and labour-intensive process which requires optimal conditions, constant vigilance, and grueling months of patient tending, harvesting, and curing. The vanilla plant is characterized by its vine-like appearance and the profusion of flat, angular, blade-like leaves of a thick, leathery texture that grow in seemingly asymmetrical patterns over its chosen ‘host'. The vanilla plant is also discernable for its while or ivory-hued flowers, notable for the marked presence of the tubular growth that springs from the main axils, sporting delicate and often fragrant petals. During peak season, the whole of the plant can become covered in flowers, although its inflorescence is only short-lived. The fruit of the vanilla begins as a pale-green stick or very thin pod, which takes a long as nine months to fully ripen and darken. Both the pollination and the ripening of the plant require patience (the plant is hand-pollinated in the absence of natural pollinators – a trick discovered by a slave, one Edmond Albius, in 1841), making the spice costly. Vanilla beans are only useful in its ripe form, in which they blacken and shrivel up, and begin to exude its familiar unique aroma. The internal parts of the vanilla bean containing its ‘pulp' and seeds possess the greatest number of volatile substances, and are hence the most commonly employed culinary condiment, although the skin of the vanilla pod itself is also aromatic in its own right. Vanilla may be employed whole, or in extracted or powdered form. Today, vanilla is employed chiefly as a flavouring for pastries, savoury dishes, desserts, and light snacks and beverages. 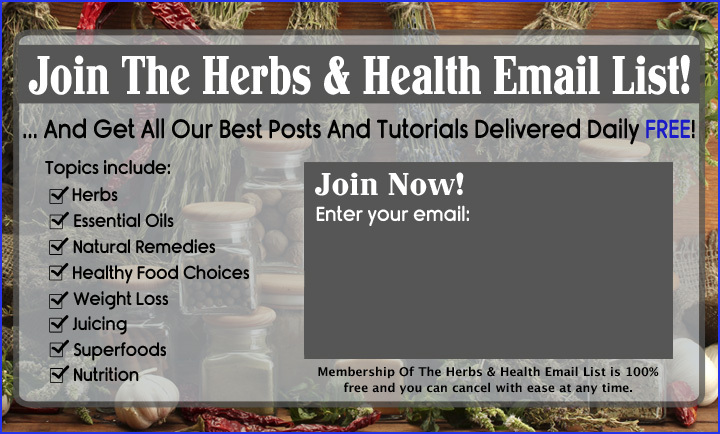 Extracts derived from its essence is employed in perfume making, aromatherapy, and cosmetology, while the whole bean itself is sometimes (but rarely) used medicinally despite its potent therapeutic properties. 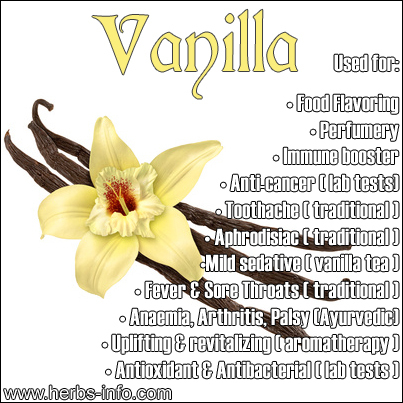 Despite its minor employment in common alternative medicinal remedies, vanilla is a highly useful medicinal plant. The integration of pure vanilla into foodstuffs itself possesses powerful beneficial effects, as it not only helps to boost the immune system, but it also helps to fight off minor ailments. A remedy consisting of a mild decoction whole goat's milk and vanilla, combined with a whole egg and a dollop of honey stirred until frothy has been a traditional remedy for weak and convalescent individuals the world over. It is typically given to pregnant women, nursing mothers, small and sickly children, as well as debilitated elderly individuals to boost their health and proves to be nutritive, nourishing, and soothing for patients who are unable to take or keep down solid foods. Nowadays, vanilla is even integrated into the creation of cosmetics such as soaps, shampoos, and (in time-honoured fashion) perfumes. Powdered vanilla mixed with reetha (soap nuts) [Sapindus mukorossi] makes for the perfect skin exfoliant, encouraging the repair and revitalization of skin, while allowing one to relax and de-stress in the process. A potent decoction of vanilla beans cooled and employed as a hair rinse, or a cold infusion of whole vanilla pods in apple cider vinegar makes for a great after-shampoo hair rinse that enlivens and perfumes the hair naturally. In aromatherapy, oils infused with whole vanilla pods, or base oils mixed with extracts of its essential essences are employed as relaxing massage oils. When burnt using a diffuser, it is said to help alleviate stress, uplift one's mood, and counteract depression. Sniffing vanilla frequently is even said to improve mental clarity and focus, as well as evoke feelings of safety and comfort making it a perfect household scent. The scent of vanilla (like the mild tincture of the pods) is also believed to be an aphrodisiac by some individuals, which is why it's essential oils are often incorporated in candle-making, potpourri, and incenses. The study results from the study of Choo, Rukayadi, and Hwang (2006) suggest that vanilla inhibits bacterial quorum sensing,  or the “regulation of gene expression in response to fluctuations in cell-population density.”  Choo, Rukayadi, and Hwang (2006) utilized Chromobacterium violaceum CV026, a Tn-5 mutant, to monitor the quorum sensing inhibition and measured the inhibitory activity by quantifying the production of violacein (a bactericidal, tumoricidal, trypanocidal, and antileishmanial pigment reported to also inhibit Plasmodium growth in vitro and in vivo ) using a spectrophotometer. Since Gram-positive and Gram-negative bacteria employ quorum sensing communication circuits to regulate different physiological activities, such as symbiosis, virulence, competence, conjugation, antibiotic production, motility, sporulation, and biofilm formation,  by extension, vanilla's inhibitory activity on bacterial quorum sensing also disrupts these processes, thus preventing bacterial pathogenesis. It should be noted that despite the commonplace availability of vanilla extract, not all products labeled as such is authentic, and one can usually tell due to its cheap price. When employing vanilla for medicinal or general therapeutic purposes, it is better to purchase whole vanilla pods or pure essential extracts from reputable dealers.